Article II, Section 2, Clause 2 of the U.S. Constitution, also known as the “Appointments Clause,” gives the president the power to nominate public officials, with the advice and consent of the Senate, including administrators of executive agencies such as the Justice Department. In the entire history of the U.S. Senate, it has confirmed more than 500 administration nominations. There have been only nine rejections and 15 withdrawals. Clearly, the Senate has throughout its history granted to the president a great deal of deference with his nominations, rejecting appointees in all but the most extreme situations. Why, then, are Democrats working so hard now to prevent President Donald Trump from filling one of his most important administrative positions: head of the Environmental Protection Agency (EPA)? 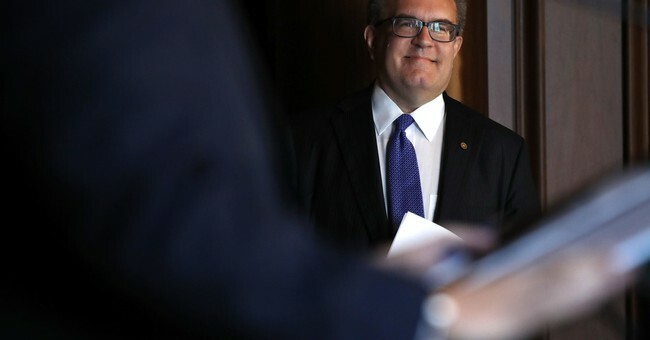 President Donald Trump appointed Andrew Wheeler as EPA’s acting administrator on July 5, 2018, and on January 9 of this year officially nominated him to fill the role of administrator. Despite expected Democratic opposition, Wheeler was successfully approved by the Senate Environment and Public Works Committee on February 9 and will likely face a full Senate confirmation vote later this month. Despite a long track record of success, Wheeler is facing intense opposition from Democratic senators, but why? Under Wheeler’s leadership, EPA is being restored to its original mission of protecting our air and water while upholding property rights, and the agency is finally balancing protecting the environment with much-needed efforts to encourage economic development. Under Trump, EPA has finalized 33 deregulatory actions, at a savings of almost $2 billion to Americans, changed the definition of the Waters of the United States rule to prevent massive regulatory burdens on businesses and landowners, removed 22 sites from the Superfund National Priorities List, nearly eliminated the backlog of chemical submissions and registration actions, and helped finance more than $4 billion in water infrastructure projects. Wheeler’s EPA has also taken the important step of crafting the Affordable Clean Energy (ACE) Rule to replace the disastrous Clean Power Plan (CPP), which caused significant economic harm by forcing reductions of GHG emissions from power plants. The CPP was such an egregious—and arguably unconstitutional—power grab that, in an extremely unusual case, it was stayed by the U.S. Supreme Court in February 2016. The ACE Rule is a far more reasonable approach that views the states as partners, not adversaries. Under Trump, greenhouse gas (GHG) emissions from major industrial sources decreased by 2.7 percent during President Trump’s first year in office. This is especially noteworthy as the United States has done a better job of reducing these emissions than many of the major country signatories to the Paris Climate Agreement, which Trump pulled the United States out of in 2017. GHG emissions in the European Union have risen since it adopted the Paris Agreement in December 2015! Time and money are finite resources, and federal departments and agencies must prioritize them carefully. The Departments of Energy and Interior, under Trump appointees Secretary Rick Perry and Acting Secretary Bernhardt, are promoting American energy dominance—reversing the anti-energy policies of the previous administration, which declared an unnecessary and destructive war on fossil fuels. Opponents of Wheeler’s confirmation unfairly complain that the Trump administration has not protected the environment, but the existing data do not support that often-repeated charge. These radical environmentalists have distorted priorities, as is evidenced by the Democrats’ embrace of the socialist “Green New Deal,” which treats carbon dioxide as a source all evil, despite the fact CO2 is a benign, clear, odorless gas that is required for all life on Earth. Radical environmental groups now seem more interested in attacking businesses and fighting capitalism than protecting the environment, which is what Wheeler’s EPA has been successfully doing for months. It’s time for the Senate to act and fulfill its constitutional obligation by immediately confirming Andrew Wheeler as EPA administrator. Republicans in the Senate shouldn’t allow radical environmentalists in the Democratic Party to stop this highly qualified candidate from continuing to lead the effort to reform the EPA.